There was a regularly scheduled communion at every lunch break in the plenary hall at General Conference 2004 in Pittsburgh. On the day the votes went badly yet again for lesbian, gay, bisexual, transgender and queer (LGBTQ) people, we decided as a movement to go to that communion service, where we could stand in the presence of the broken and resurrected Body of Christ. We did this as a means of re-asserting our presence in that Body. We did this as a means of resistance against the false institutional proclamation of one cup, one Body, and one baptism, when clearly the actions of the General Conference actively sought to harm and exclude members of that Body. All forms of our resistance and disruption are embodied statements that the unity of the church cannot continue to come at the cost of LGBTQ lives. These same acts of resistance are theological affirmations that the resurrected Jesus lives on in our whole and beloved queer bodies. There was weeping and there was anger at communion. There was a need for a deep and spiritual release of the violence that had just been done to the queer body of Christ. Because when votes are cast against the very existence of LGBTQ lives, that is what is happens: violence. Christ’s body crucified again. To not act in the face of such violence does further violence. When the sacrament was over, Rev. James Preston grabbed a chalice from the communion altar and smashed it on the floor. The smashing of the chalice was not a planned disruption. While there were many interpretations of that moment of breaking the chalice, in fact there was no chaos, no storming the altar, no desecration of the sacrament. There was a holy anger that took shape in a prophetic act. A movement of the Spirit interceded to express anguished sighs too deep for words. In the breaking of the cup, Christ spoke to the real brokenness of the moment. 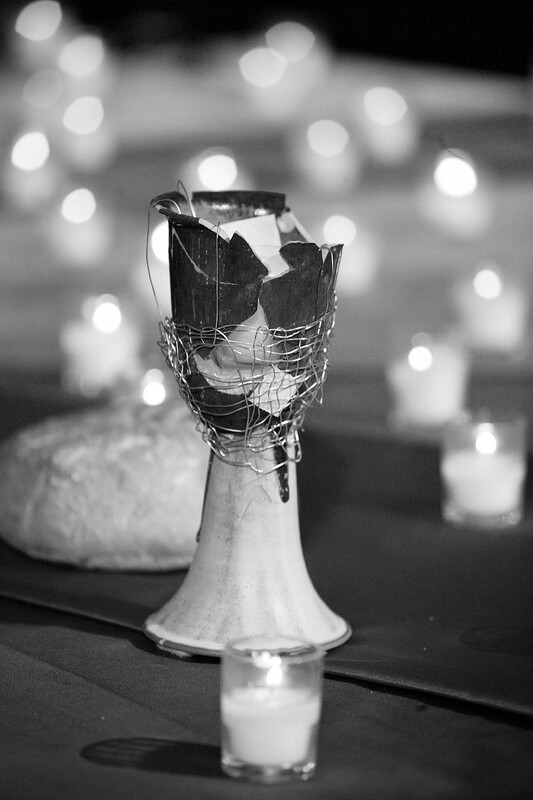 The bishop who presided at the communion table was distraught by the destruction of the cup. He got down on the floor and started gathering up the pieces. Others joined him in the gathering. I had an instinct to take a piece. I had some internal resistance to making the moment feel better than it was. I didn’t want all of the pieces to be gathered up. 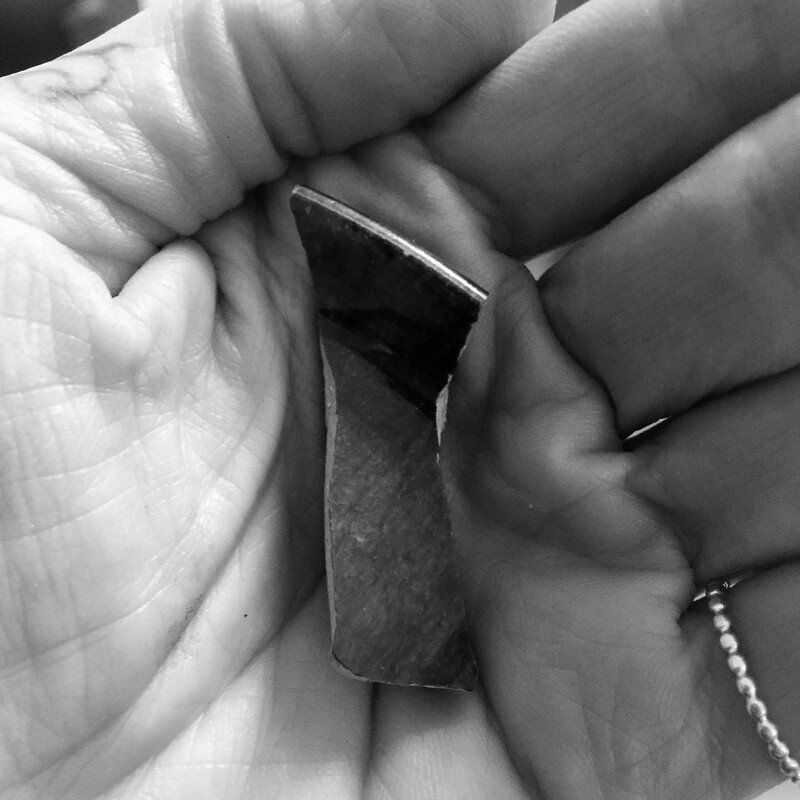 I pushed toward the front of the group, bent down, picked up a piece off the floor, and put it in my pocket. At the time I had no idea that later they would try to reconstruct the chalice from the broken shards. I have always had that piece of the cup. I rarely speak of it or even look at it. It sits in the same box with other sacred items from across the years. I know exactly where it is in my home. It is in my consciousness. When a recent article came out in the United Methodist News Service surveying the history of LGBTQ protest at General Conferences, I saw a picture of the reconstructed cup and I remembered my piece. I went to the box, took it out and held it for a while. Twelve years later. Things are still so broken and bad in this church for queer people. It is so devastatingly sad and wrong. The LGBTQ participants in the communion service in 2004 were accused of breaking the church body and fomenting division. This accusation, which will no doubt be leveled at pro-LGBTQ forces at this 2016 General Conference, is completely ludicrous. The Body already was and is broken. The piece of the cup I possess stands as a symbol of this. In the church there simply must be some recognition that parts and pieces of the LGBTQ Body of Christ in the United Methodist Church have been not only broken, but lost. Left. Dead. Gone. Taken. Parts that aren’t coming back to be made part of the whole. Irretrievable by choice or by force. Despite accusations to the contrary, many of our actions as pro-LGBTQ organizations and as a movement at our General Conferences are Holy Spirit led. This was true of this moment of communion in Pittsburgh in 2004. This will also be true of the disruptive actions of pro-LGBTQ forces at this General Conference. You may not experience it this way, but we ask you to be open to the possibility that this may be true. The LGBTQ body may be broken but the Spirit of Christ is alive in us. All forms of our resistance and disruption are living, embodied statements that the unity of the church cannot continue to come at the cost of LGBTQ lives. Jesus the Christ is working through our movement to speak truths and to resurrect the parts of the broken body that remain. Sue Laurie is Being Ordained in Portland! Sue Laurie sent the following letter to friends and colleagues around the country, inviting them to her ordination at the 2016 General Conference in Portland, Oregon coming up in May. If you are not able to stand with Sue physically in Portland, but would like to participate in Sue’s ordination, please read through the entire invitation to the end. There are directions for writing and sending good wishes and affirmations of Sue’s ministry among us. As we have known each other for many years, you know my sense of commitment to my calling as a pastor. You may be surprised to realize that I graduated from Garrett-Evangelical Theological Seminary with my Master of Divinity degree over twenty years ago. Wow. You have been significant in my journey as I continue to pursue this vocation. Over the years I have officiated at baptisms and communion tables. It has been my privilege to preside at weddings and holy unions for lesbian, gay and “straight” couples. I have spoken at funerals. I have begun small “house churches” for LGBT people who often cannot find welcoming church family. “BYKOTA” gathered folks together in NW Pennsylvania, “Rainbow Circle” gathered people in the NW suburbs of Chicago. In ordinary and significant ways, we have been church for one another. These times spent with you have helped me to claim my identity as a pastor within community. I am writing to let you know that I regard our shared times as sacred. I am humbled by your trust and appreciation. I am grateful for each one. These moments defy the reality that people like me are not “ordainable” by United Methodist law. I feel that I have been ordained over and over. I was not called by God for the institution of the United Methodist Church. I was called for people. I have felt the Holy Spirit in my adventures… they have been worth my life. Through your invitation to participate in church family life, I have felt encouraged. So much so, that I have realized that it is time for me to publicly claim the ministry you all have granted to me. At the United Methodist General Conference in Portland this May, with those who wish to affirm me, I will claim and celebrate my ordination… I will let go of the institutional rejection and celebrate the authority that so many have offered, a grassroots ordination as Rev. Susan Laurie. I will “come out” as ordained and take up the responsibilities of one who has been called and affirmed for ministry. My adventures are my credentials. These are treasures of heart and soul that have been the fuel of my resiliency for all these years. I am celebrating my ordination at General Conference! Love Prevails will help me with the ceremony. And you are invited to participate. I would like the first ring of people who can be present in Portland to be openly LGBT folk and from there everyone is welcome. We may be a small crowd that day, but that will be enough. Jesus did say, “Where two or three are gathered in my name, I am there among them.” Matthew 18:20. 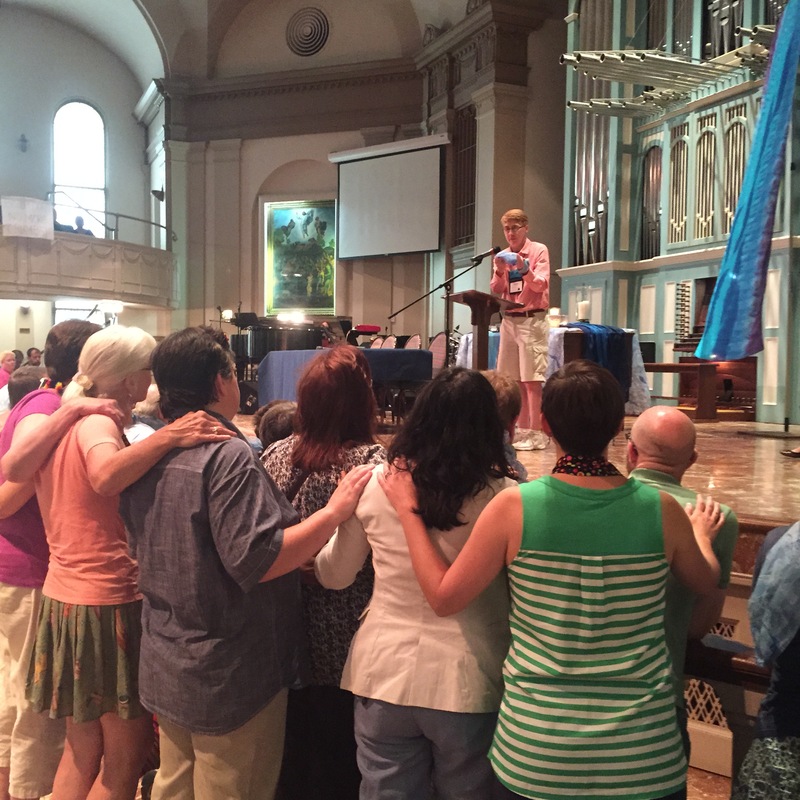 Yet, we are not a small in number – we are part of a larger cloud of witnesses, United Methodists even, who have continually offered an understanding of God’s inclusive love for lesbian, gay, bisexual and transgender people. 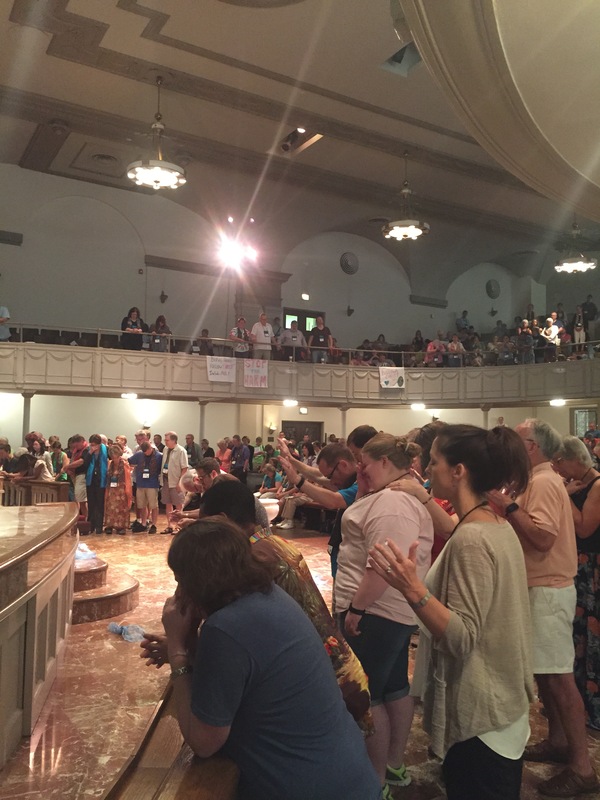 Of course, most people cannot get to Portland to stand with us physically, but you can be part of this moment… this time when our public witness of an open communion reveals that LGBT people are already on both sides of table; clergy and laity, pastors and people. Sue, I have seen the Holy Spirit at work when you _____________________________________. Yes, count me as one of the ordaining cloud of witnesses! I send my prayers for continued ministry. _______________________________________________________________________________.. If you send your name and address, I will send a note after General Conference. _______ I remain anonymous. You know, it can be dangerous out here. You are a treasure to me. I am so grateful for the foundation of Christian teaching that I received as a child and the gracious, committed witness of love and grace that has constantly been part of my life as an adult. So many venues, so many friends and teachers. Thank you. Why do we keep trying this tactic? What do they do to persuade? But what game are we playing? But that is not the same thing. We gotta think about these things some more. At that time, Bishop Dorff was about to make an official episcopal ruling on the matter of the candidacy of queer-identified M Barclay (formerly known as Mary Ann Barclay) for ordained ministry. He had previously refused to rule when the Rio Texas Conference Board of Ordained Ministry denied the District Committee on Ministry’s decision to recommend M to move forward with their candidacy for ministry, but had been ordered by the Judicial Council to reconsider his own decision. So after Bishop Dorff’s comments at the break, I spoke with him about his words and his coming decision. He told me that I had been an agent of the Spirit to him that morning and he asked me to pray for him, which I agreed to do. Ever since that time, at every CT and Council of Bishops meeting that Love Prevails has disrupted over the past two years, I have made a point of greeting Bishop Dorff and reminding him of our connection. He is always exceedingly warm and gracious, and he gives me big, Southern hugs, which I actually do not mind. I don’t mistake our connection for anything like real knowledge of one another, but we do have a connection. When I heard that Bishop Dorff was coming to bring greetings to Gather at the River 2015, held in San Antonio at Travis Park UMC on August 6-9, I wasn’t surprised. It is customary to invite the bishop of the resident area where these progressive UMC conferences are held. It is common knowledge that Bishop Dorff has not been a supporter of LGBTQ people, but is a supporter of the Disciplinary status quo that inflicts harm on queer folk. Some of those present at Gather at the River thought it particularly good of Bishop Dorff to come, even brave, considering his known stance. I thought it was presumptuous. In the past two years of deeply disturbing contact with the highest levels of our denomination through the work of Love Prevails, I have seen the very ugly sides of the episcopal imaginings of their benevolent power. 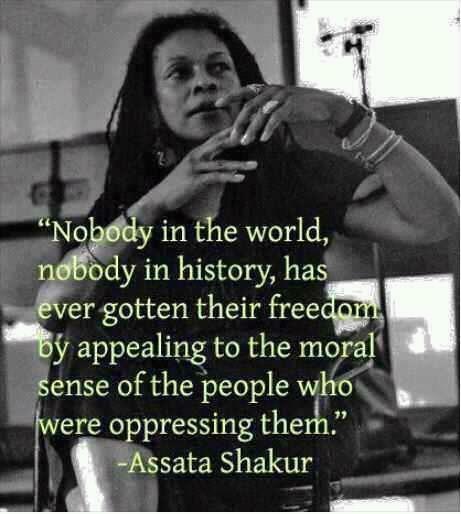 And their stated lack of power to make change. The leaders of our denomination do not see themselves as perpetuators of injustice against LGBTQ people in the midst of their maintenance of the institution, and yet they very much are. So I imagined that Bishop Dorff thought it would be really good and welcoming of himself to say something kind to queer people, something that would not be considered controversial by anyone else. I didn’t want to let that happen without a marking of protest. 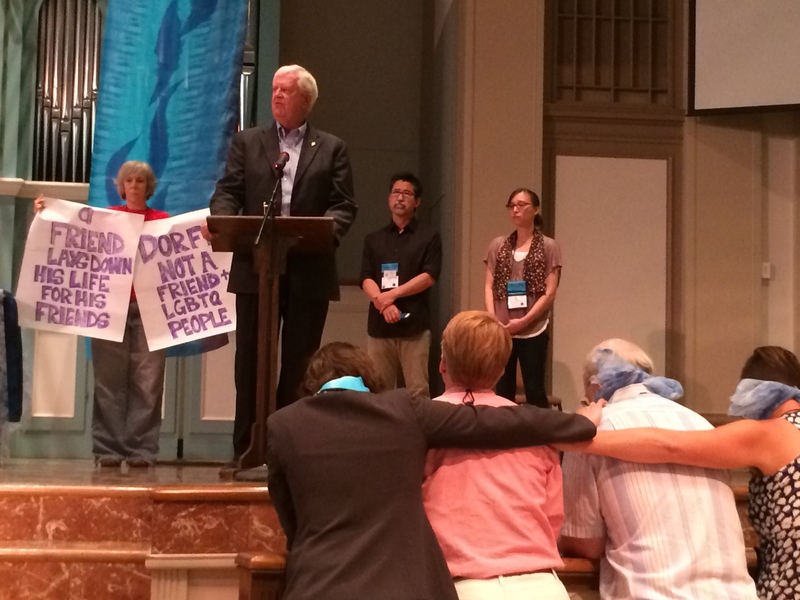 Some might think that the protest that developed during Bishop Dorff’s remarks was highly coordinated. On the contrary. The night before, I understood that some Love Prevails members and a few other people would hold signs within the sanctuary while he spoke. Nothing major, just a few pointed messages. I wanted to position myself somewhere where Bishop Dorff could really see me, because of our connection. I wasn’t sure how it would play out, but I knew I wanted to look him in the eyes and speak to him, because we have history. When I walked into the sanctuary late that Saturday morning, it seemed a few more people had become interested in the witness, and now there was talk of kneeling at the altar, preparing material to create gags, and hanging signs and messages to the bishop from the balcony. I quickly made two signs that read, “FRIENDS LAY DOWN THEIR LIVES FOR THEIR FRIENDS” and “BISHOP DORFF IS NOT A FRIEND TO LGBTQ PEOPLE.” I didn’t hang my signs from the balcony. I took them with me. And when it was time, I knelt at the altar rail. Except for acknowledging that we had shared a Pentecost moment in the past, he mostly nodded and smiled. I don’t think he was shaking me off; I think he was quite nervous and unprepared for what was transpiring. He smiled, shook his head at me and said, “You know I love you, Julie.” Which was a little gross, but I honestly didn’t take his words as insincere. During all of this there was ongoing kneeling, praying, weeping, singing and speaking by others in attendance. Clearly the Holy Spirit was moving in the moment and even Bishop Dorff knew it. He said so. Though this witness took place as a result of far more than the actions of Love Prevails members alone, what resulted felt like a classic Love Prevails experience. We #Showup prepared to seize prophetic moments of Spirit guidance. We #Disrupt. We are often perceived and described, as in this case, as disrespectful and bullies. We stand firm in the knowledge of ourselves as utterly authentic in responding to the Spirit as She reveals injustice and violence towards LGBTQ persons in the United Methodist Church. We understand that the expressed embodiment of our truths is difficult and uncomfortable for some people. As the saying goes, the truth hurts. We are often accused of “hurting our cause.” This is a clear reversal of who and what the problem is. I did not disrespect Bishop Dorff, and neither did the witness disrespect him. He himself admitted to the working of the Spirit in the moments of protest and afterwards. Ask him yourself. Nonetheless, injustice does not deserve our respect. All United Methodist bishops must be held accountable to whom and how they are agents of injustice in the ongoing perpetration of discrimination and oppression against gay folks in our church. Not one of them, including Bishop Dorff, can presume that their role or status as a bishop gives them the right to say a few words about inclusivity to gloss over the pain that they the bishops have caused by direct action or inaction, to a multitude of our LGBTQ family in Christ. We need our bishops to stop throwing us breadcrumbs in the form of welcoming-sounding words, expecting us to keep waiting and praying for an end to discrimination within our church, when the power to end the pain and the hurt lies in their hands. Bishop Dorff said he believes that the UMC should be fully inclusive, so let’s see him bring full inclusion to the Rio Texas Annual Conference and work toward full inclusion in the connection. My sign said that Bishop Dorff is not a friend to LGBT people, because friends lay down their lives for their friends. Friends don’t let their friends get hurt when they can stop the harm.